Hydroacoustic technology is a powerful tool for underwater archaeological research. 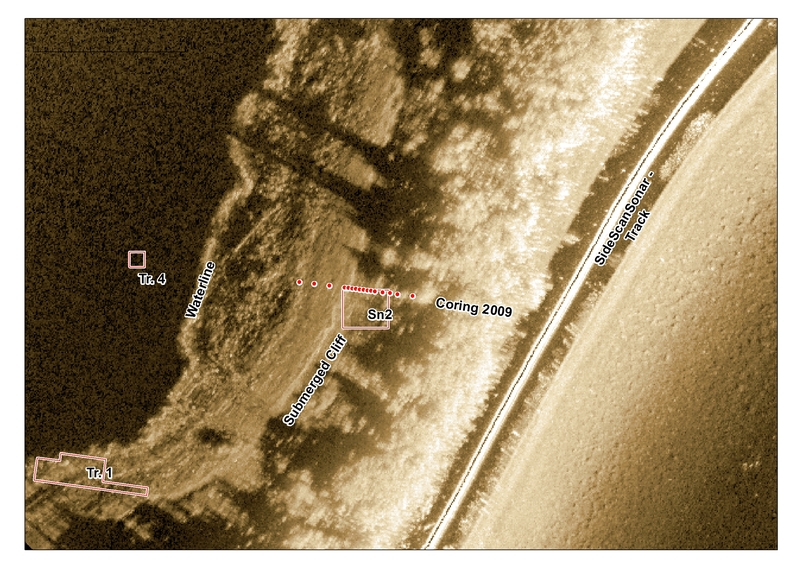 It allows for the rapid, consistent, non-invasive assessment of large submerged areas, both surfaces and sediments, and is a source of hydrographic baseline data which is in many cases indispensable in the investigation of singular objects like shipwrecks as well as whole submerged landscapes. At least in the scale of European archaeology, however, the deployment of sonar technique has been more or less restricted to maritime environments. In comparison to the large number of case studies in river estuaries, coastal shelfs, and the open sea inland water investigations carried out in combination with sonar technology have so far remained rare exceptions. This is mainly due to the specific conditions connected to fresh water environments – navigation problems in sometimes extremely shallow water conditions, obstacles like trees or rocks near the shores jeopardizing expensive equipment, and plant metabolism causing problems with the interpretation of acoustic data. On the other hand hydro – physical conditions in inland waters are basically the same as in salt water, and principally the same benefits can be expected. In disciplines like hydraulic engineering and also in geological investigations Single Beam Echo Sounders (SBES), Sub-bottom Profilers (SBP), Multibeam Echo Sounders (MBES) or SidescanSonar Systems (SSS) are regular working tools. Fig 1 (click to increase): SBP, calculated from HF (180kHz) and NF (70kHz), visualized in 9 slices. The pictures document strong hydroacoustic echoes in the area between waterline and underwater cliff. Within the Degersee Project and the subsequent Beyond Lake Villages Project we combined SBES, SBP, SSS, with terrestrial investigations and diving operations. The Degersee II site, discovered in 2009, is a lake shore site dating to the Final Neolithic at about 3300 BC. The site is positioned at the Northern shore of Degersee, a small pre-alpine lake some kilometres north of Lake Constance. While some portions of the site are covered by peat and bog deposits, to the south large areas are positioned permanently underwater. A bathymetric survey carried out by the LUBW at the beginning of the field work provided with bathymetric baseline data for a basic elevation model of the lake floor. Diving operations were carried out in 2009, in 2015, and 2016. In 2012 we investigated the shallow water zone with a SBS, using a SoSo Sediment Sonar operating with two combined frequencies (180/70 kHz). In 2018 we deployed a DeepVision SSS with 680/360 kHz frequency in the same areas. The penetration depth of SBS depends – besides the deployed frequencies - much on geological factors like sediment conditions and stratigraphical sequences. Fig 1 shows the investigation area with a series of nine software – processed depth layers between 0m and 1m. These layers represent acoustic conditions / reflections in slices of 10cm thickness. The colors – black, red, magenta, orange, yellow, green – indicate different values of acoustic reflections, with black signaling very strong reflections, red 10 times weaker reflections, and so on. White means “no data”, indicating that all acoustic energy has been absorbed or reflected. In the case of Degersee, the silt- and peat packages allowed for an investigation depth of about 1m. Fig 2 (click to increase): Underwater cliff with cultural components exposed. In the front a pile (Photograph courtesy W. Hohl / LAD). It can be seen that black and red color dots occur mainly in a strip about 15 – max. 20m wide, in an area directly adjacent to the shore. Black and red colors can be observed consistently down to 40cm depth. The comparison with our coring results and also the excavation reveals that black and red dots in this case indicate cultural layers – wooden timbers, building materials like clay, artefacts, and pile foundations. Near the shore these cultural deposits are partly eroded and appear directly at the lake floor; more to the east and south and towards the deeper water they are still embedded in silt layers positioned in maximum 1,5m water depth. They end abruptly in a steep submerged cliff, which is about 0,5 high and again about 15 – 20m distant from the shore. The SSS visualization (Fig 2) shows this topographic anomaly as a bright line. To the west the data model reveals the steep step of the waterline, and the shallow water zone with the small irregularities of a lake floor covered by eroded cultural deposits, stones, loose wood, and pile tops. The underwater cliff appears as a topographic step, leading from the reed promontory at the south to the North. The area between this line and the shore is exactly the same as the area marked by red and black dots. 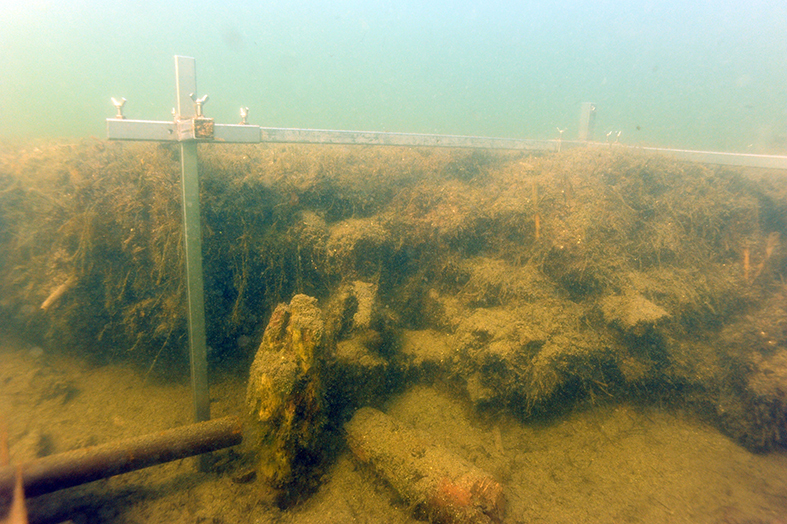 To the deeper water of the east (and towards the bright line marking the track of the sonar towfish), large patches of water plants mask the lake bottom. Fig 3 (click to increase): SSS visualisation in the underwater cliff area (compare Fig. 1). Our attempts to combine conventional underwater archaeological techniques with sonar devices are still in a state of experiment. The Degersee case study provides with a better understanding of chances and restrictions. 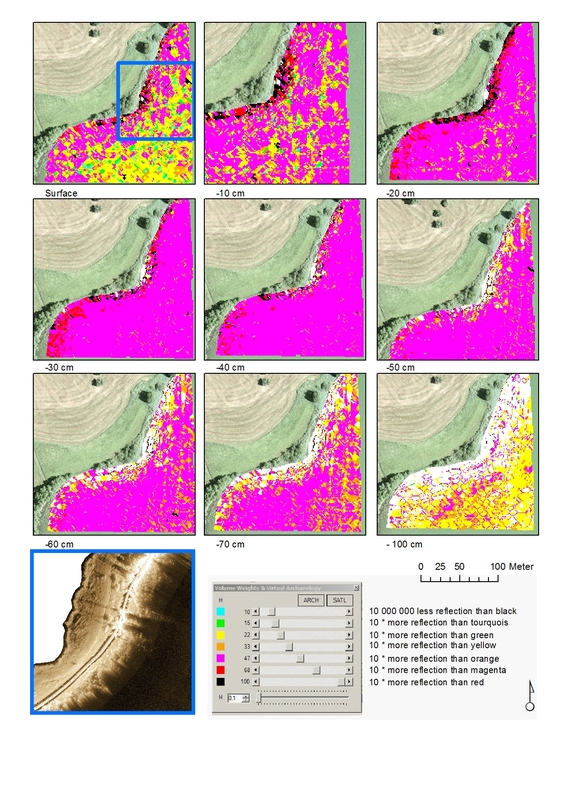 It can be shown that it is possible to detect prehistoric cultural deposits by SBP, and that SSS can deliver relevant information on topographic conditions of the lake floor. At least with the devices deployed in our case study the data is not well enough resolved to provide with stratigraphical details or to show individual objects at the lake floor. It may be stated, however, that hydroacoustics can provide with consistent results in small lakes, in very shallow water, and in prehistoric sites. More reading: MÄDER, Andreas, Hilmar HOFMANN, Johannes HUGENSCHMIDT, Martin MAINBERGER, Tim WEHRLE, 2016. Unesco-Weltkulturerbe im Kanton Schwyz - vom nachhaltigen Umgang mit der Pfahlbausiedlung "Freienbach-Hurden Seefeld".